Reading Jess Nevins’ volume of annotations to Alan Moore and Kevin O’Neil’s Black Dossier, I came across a reference to a novel called Scream for Jeeves, in which the imperturbable valet created by P. G. Wodehouse battles cosmic monsters from the world of H. P. Lovecraft. Just the sort of thing to brighten up a winter afternoon, I thought. Alas, the book proved to be out of print and not to be had for love or money (or at least as much money as I was willing to part with). My disappointment did not last long, however. My recent reading has provided me with plenty of tentacled horror from beyond the stars. I enjoy the art of Ben Templesmith, and not just because he was kind enough to do the jacket for my book. His art is the diametric opposite of the blandly drawn, high color value, computer rendered work on display in most contemporary comics. Ben’s paintings are full of murk and mildew, scratchy lines and turbid colors, busting forth into infrequent explosions of white-hot fire and crimson eyeballs. I like Ben’s work even better when he illustrates his own writing, and his deadpan humor and warped creativity are on full display. Templesmith’s powers are shown to best advantage in Wormwood: Gentleman Corpse. The premise is simple. A corpse-possessing worm from an another dimension protects the Earth from demonic catastrophe. In the most recent volume, parasitic squid creatures attempt to “convert” every living thing on Earth. Templesmith has taken this Lovecraftian concept and twisted it into something almost unrecognizable, mixing in exotic dancers toting flamethrowers, the Apollo astronauts, rednecks with faerie wings, and Elvis. What would have been the major theme of a Lovecraft story becomes a mere chew-toy in the foaming jaws of Templesmith’s imagination. Charles Stross treats Lovecraft’s legacy with a bit more reverence. I recently read his Atrocity Archives on the recommendation of Pseudopod’s Alasdair Stuart (a recommendation attached to the excellent New Weird story “Jihad over Innsmouth” by Edward Morris). The protagonist, Bob Howard, works for the Laundry, a covert intelligence agency sworn to protect the UK from extra-dimensional horrors. Bob is a math geek, a hacker who came to the notice of the Laundry after nearly summoning Nyarlathotep with his PC. The books opens with Bob stumbling his way through a B&E at an industrial park, bent on destroying some dangerous computer files. In a scant two-hundred pages, the novel cranks up quite astonishing levels of terror, as Stross crossbreeds classic cosmic horror with cold war spy tropes and the all too human monsters responsible for the Nazi Holocaust. Before book’s end, Howard dons a pressure suit and follows a platoon of SAS commandos though a gate into a chill and airless world. He emerges greatly sobered, if not exactly mature. Atrocity Archives is paean to Lovecraft and Len Deighton combined with a nerd’s feast of speculative science and historical detail. Charles Stross has called the mythology created by Lovecraft the greatest open source shared world ever written. I wouldn’t have put it quite that way myself, but his observation is essentially true. As long as new authors read and love old stories, Lovecraft’s creatures will continue to find gainful employment. Frightening young boys with self-esteem issues. Plotting against coffee-addled hackers from covert government agencies. And yes, battling exotic dancers with flamethrowers. For their 100th podcast, the editors of Pseudopod have set aside their usual practice of employing living writers and have chosen one who is very much deceased. Last week they presented an excellent reading of “The Music of Erich Zann” written by the pervert from Providence himself, Howard Philips Lovecraft. To me, this was especially welcome news, as audio files are the only way I can enjoy the work of this seminal writer. You see, whenever I attempt to read the work of H. P. Lovecraft, read it from a book, that is, I get terribly ill.
Now let’s be clear. This is not the sensation that occurs when I see, smell, or in this case read something that induces a temporary nausea. I have read exactly two books that made me ill in this way, and neither of them was written by Lovecraft. One was The Wasp Factory, the first novel by popular Scottish author Iain Banks. A deliberate exercise in sensationalism and controversy, The Wasp Factor details the homicidal adventures of Frank and his older brother Eric, a former medical student who sets fire to, and occasionally eats, stray dogs. Gross as that may be, it was the origin of Eric’s insanity that sent me running to the toilet. Suffice it to say that the scene involves a poorly attended infant with an incomplete skull. Read it at your own risk. The second book to make me vomit was Exquisite Corpse, by Poppy Z. Brite. There is a lot here the stomach could object to. Indeed, the book was rejected by a number of publishers before finding a home. There are many characters and subplots, but the main story revolves around what happens when serial killer Andrew Compton and cannibal Jay Byrne meet and join forces. Brite avoids the obvious homicidal rampage, choosing instead to let this dangerous relationship culminate in the death of the more submissive Byrne. But it is the fate of Tran Vinh, their perfect victim, that made my stomach heave. I will confine myself to saying that he is alive when Compton and Byrne begin to play with him. Exquisite Corpse is perhaps the most elegantly constructed horror novel I’ve ever seen, but I will never read it again. Lovecraft does not make me ill in this way. There is nothing specific in his subject matter, no particular passage or turn of phrase, that trips my gag reflex. It’s just that every time I start a Lovecraft story, I get sick. It began with the novella “At the Mountains of Madness.” I remember very little of the prose, as I never got very deep into the story. I recall a description of penguins that managed to make those terminally cute birds seem grotesque and menacing. And I remember the cold. The frigid winds of the Antarctic setting seemed to chill my skin and settle into my bones as I read. Before long, I began to shiver despite the summer heat. In short, I soon came down with a bad case of the flu. I narrowly avoided a trip to the hospital, staying hydrated with frequent sips of flat ginger ale, but I ate nothing solid for a week. A couple years later, I decided to try Mountains of Madness once more. After all, I’m always reading something, so I’ve gotten sick in the middle of plenty of other books. Again, I got a few pages in only to feel that familiar chill sink into my body, like a frozen sun radiating cold from the center of my chest. It was food poisoning this time. I spent a sleepless night on the bathroom floor, spasms twisting my gut. It took a month of acidophilus supplements to rebuild my digestion, and I have been unable to eat dairy products ever since. Like one of Lovecraft’s protagonists, I attempted to apply reason to my superstitions the third time around. Determined to avoid Mountains of Madness, I selected “The Shadow Over Innsmouth” instead, largely because I’d recently read about the efforts of author Caitlín R. Kiernan to discover the real life inspiration for this fictional locale. To make an obvious story short, I caught the flu again, and swore off Lovecraft forevermore. I can thank Tim Kane for convincing me to try Lovecraft on audio book. 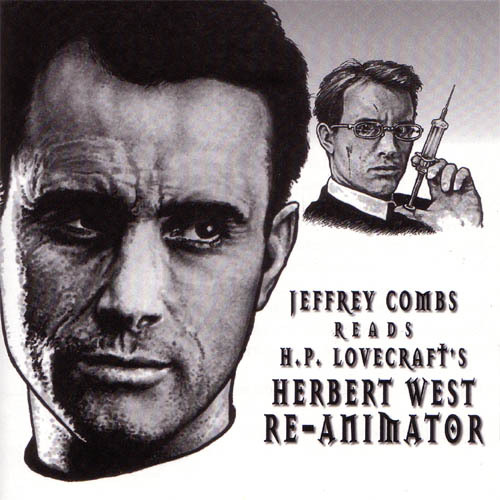 He loaned me a CD of “Herbert West—Reanimator” read by none other than Jeffrey Combs, star of the Re-Animator movies. Combs’ presence is not just a marketing gimmick, either. Anyone who hears him deliver the oddly emphasized phrase “Miskatonic University at Arkham” will never pronounce it normally again. I must confess to a moment of fear when I first popped the disk into my player. It felt as though I was deliberately eating raw beef, or maybe licking the scum beneath the trap in my sink. There were bound to be consequences. Then the story began, and I stopped worrying about my stomach and began to fear for my mind.